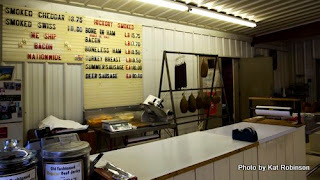 I Smelled Heaven: Coursey's Smoked Meats in St. Joe. Smoked meats have long been part of the diet in the Arkansas Ozarks. At one point in time, smokehouses were common along Arkansas's highways and byways. 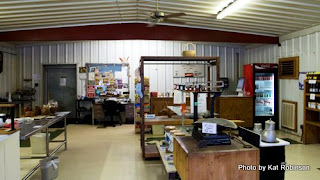 One of the few remaining shops still sits along U.S. Highway 65 at St. Joe. 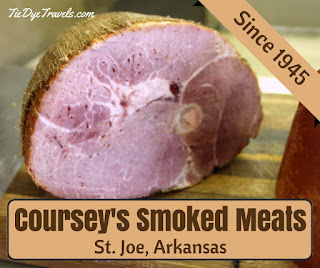 Learn more about Coursey's Smoked Meats. 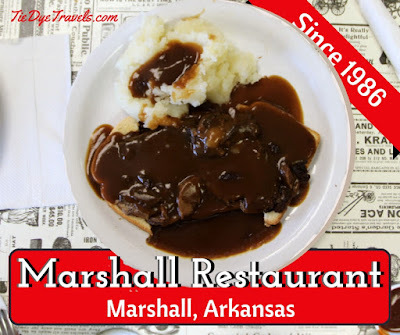 Coursey's is one of the many restaurants featured in Classic Eateries of the Ozarks and Arkansas River Valley. I understand why it’s important to change the routes of highways built over Native American paths, postal routes and dirt roads over time to make them safer. 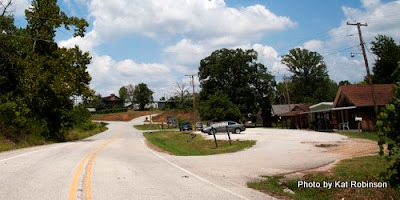 But I will never understand why the Arkansas Highway and Transportation Department decided to take U.S. 65 and relocate it between Coursey’s Smoked Meats and Ferguson’s Country Store on the south side of St. Joe. The two restaurants have been around for ages on the first ridge north of the Buffalo National River. 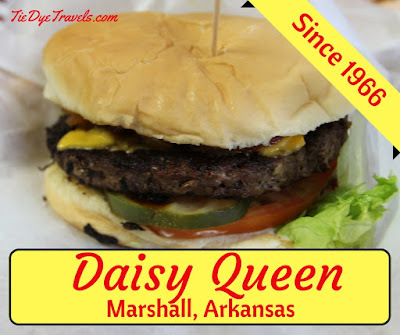 Coursey’s opened in 1945, and Ferguson’s started in 1973. 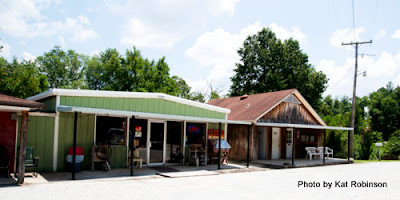 For the longest time, they were the perfect one-two punch on the right side of the road, the best place to fuel up and use the restroom before heading north. The two shops were also the best place along the route, in my opinion, to pick up gifts to take home—smoked meats and jellies, quilts and handcrafts and, of course, cinnamon rolls for the ride. 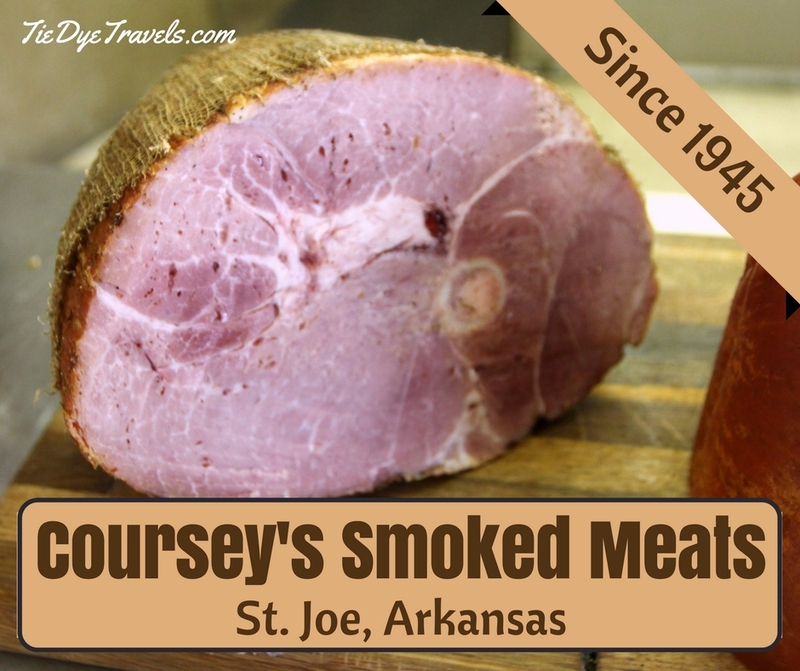 Coursey's Smoked Meats was started by Lynn Coursey -- a gourmet chef who moved back to St. Joe around the end of World War II. 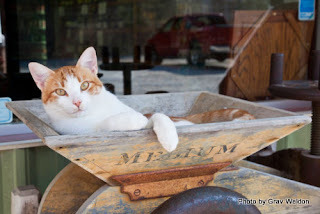 He set up shop on the unpaved road that passed through the heart of Searcy County. Mr. Coursey wanted to spend his life engaged in something that would allow him to talk with folks, and to him a good way to do that was to bring in customers traveling through the Ozarks. 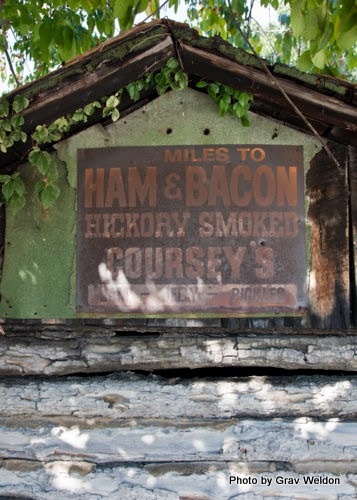 Lynn Coursey's famous hams were hung in an old dirt-floored log smokehouse that still stands today. He would tie each ham to a nail in the wall, then place an old dry-goods box around it and let it sit in the hickory smoke for hours. 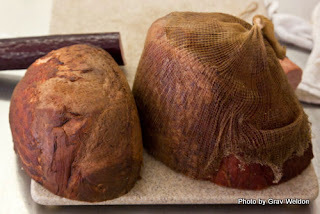 Then he'd pull it down and hang the ham by the string inside his shop -- cutting each down as it was either sold or appropriated for slicing to customers just looking for a pound or so. Today, the smoking is done in a concrete block building with aluminum fixtures inside... but... well, frankly, if you come upon Coursey's on a day when the family is smoking the meat, it smells like what I hope heaven smells like -- salty, briny, woody. 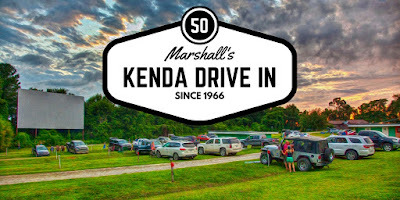 On a clear cool day you can pick up notes of that smoke all the way down in the valley of the Buffalo National River, and it'll encourage you to pull out your kayak and head up the hill. 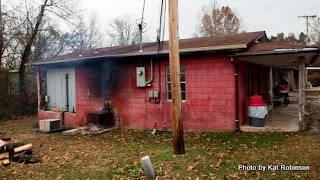 Today, Coursey’s Smoked Meats is managed by Mary Lu Coursey, Lynn Coursey's granddaughter. His great-grandkids and great-great-grandkids are also involved in the business -- smoking hams and bacon, turkey and summer sausage, swiss and cheddar cheeses. All are good. 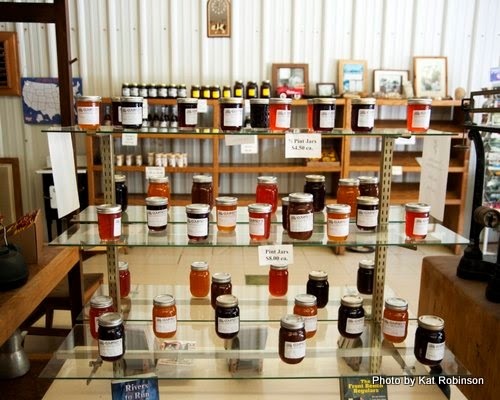 There are also jams and jellies, honey and jerky -- and a cooler full of beverages. 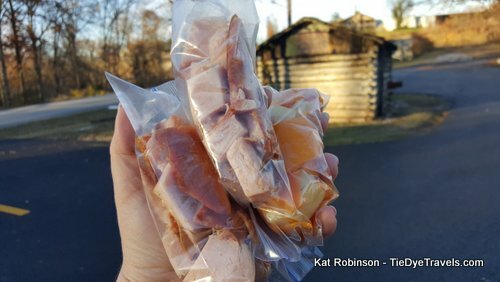 Get a whole ham or a half, a turkey or just some sliced meats... wrapped in white wax paper taped on the open end. 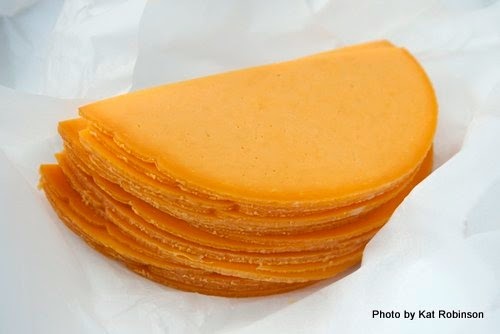 Here's a hint for you -- if there are ziptop bags full of bits of turkey or ham or cheese, get this for your travels home. 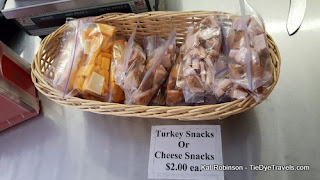 These little snack bags are a good bargain and they'll keep you from breaking into your paper-wrapped package before you get home. And sometimes, if you're lucky, there will be shrink-wrapped bags of ham and bacon ends. I have been told these salty bits are worth their weight in currency and could be used as such in meat-loving nations. Coursey's has no website... but if you're wanting a ham, bacon, turkey or the like shipped to you, call (870) 438-2503.
only be defined as a cat's heaven.